The Wagner Act of 1935, also known as the National Labor Relations Act, guarantees the right of workers to organize and outlines the legal framework for labor union and management relations. In addition to protecting workers, the Act provided a framework for collective bargaining. 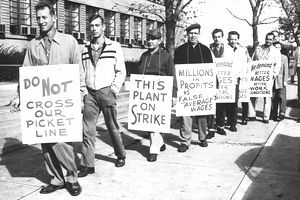 It was designed to make it more likely that commercial interests could be conducted without disruptions from strikes thus protecting businesses and the economy as well as workers. The Wagner Act also created the National Labor Relations Board, which oversees union-management relations. The National Labor Relations Board designates the legal structure for the formation and decertifying unions and conducting elections. The Board investigates charges by workers, union representatives, and employers that their rights under the Wagner Act have been violated. It encourages parties to come to agreements without adjudication and facilitates settlements of disputes. The Board conducts hearings and decides on cases that aren't settled through mediation. It oversees the enforcement of orders including the trying of cases before the U.S Court of Appeals when parties don’t abide by Board decisions. The Wagner Act was amended in 1947 by the Taft-Hartley Act that provided some limitations to the influence of unions. Legislators at that time believed that the balance of power had shifted too far in favor of the unions. The Act provides workers with the right to refuse Union membership and decertify unions if they are unhappy with their representation in collective bargaining. The Act also places requirements on unions including that they honor existing contracts without striking and avoid secondary boycotts or strikes against companies doing business with their employer. According to the National Labor Relations Board (NLRB), unions were also prohibited from charging excessive dues or initiation fees, and from "featherbedding," or causing an employer to pay for work not performed. The new law contained a "free speech clause," providing that the expression of views, arguments, or opinions shall not be evidence of an unfair labor practice absent the threat of reprisal or promise of benefit. The NLRB provides the following examples of employer and union conduct that violates the law.